Finished squares measure approximately 4 in, depending on yarn weight and hook size. Note: Work in both loops throughout except where noted. Round 1: Work 8 sc in 2nd ch from hook, join in BL of 1st sc — 8 sts. Round 2: Join CB in BL of any st, ch 1 (does not count as st), beginning in same st as join and working in BLs only, work 2 sc in each st around, join — 16 sts. Round 3: Ch 1 (does not count as st), beginning in same st as join, *work 2 sc, 1 sc next, rep from * around, join — 24 sts. Round 4: Join CA in same st as join, ch 1 (does not count as st), work 1 sc in same st as join and in each of next 3 sts, work 2 tr in the FL of the st from Rd 1 directly below (takes place of next 2 sts of current round), work 1 sc in next 6 sts, skip next 2 FLs of Rd 1, *work 2 tr in next FL of Rd 1, work 1 sc in next 2 sts, rep from * twice more, join — 24 sts. Round 5: Ch 1 (does not count as st), beginning in same st as join, *work 2 sc, 1 sc in each of the next 2 sts, rep from * around, join in BL of 1st sc — 32 sts. Round 6: Join CB in the BL of the sc that was was worked into the 1st tr of Rd 4, ch 2 (counts as hdc), continuing to work in BLs for the rest of round, work 1 hdc in next st, ch 2, skip next st, *1 dc in next 2 sts, ch 3, 1 dc in next 2 sts, ch 2, skip next st, 1 hdc in next 2 sts, ch 2, skip next st, rep from * twice more, 1 dc in next 2 sts, ch 3, 1 dc in next 2 sts, ch 2, skip next st, join — 24 dc and 12 ch-sps. Round 7: Join CC in last ch-sp made, ch 3 (counts as dc), work 1 dc in same ch-sp, ch 2, 2 dc in next ch-sp, ch 2, *(2 dc, ch 3, 2 dc) in next ch-3 sp, ch 2, 2 dc in next ch-sp, ch 2, 2 dc in next ch-sp, ch 2, rep from * twice more, (2 dc, ch 3, 2 dc) in last ch-3 sp, ch 2, join in top of beg ch — 32 dc and 16 ch-sps. Round 8: Ch 1 (does not count as st), work 1 sc in same st as join and in next st, 2 sc in next ch-sp, 1 sc in each of the next 2 sts, 2 sc in next ch-sp, 1 sc in each of the next 2 sts, 3 sc in corner ch-sp, 1 sc in each of the next 2 sts, *2 sc in next ch-sp, 1 sc in each of the next 2 sts, 2 sc in next ch-sp, 1 sc in each of the next 2 sts, 2 sc in next ch-sp, 1 sc in each of the next 2 sts, 3 sc in corner ch-sp, 1 sc in each of the next 2 sts, rep from * twice more, work 2 sc in last ch-sp, join — 68 sts. I like your peace sign granny squares. Thanks for posting this. When it says Join, does it mean use CB for round 2? Normally when i change colors I do it in the last stitch of the previous color. I’m confused about “any stitch”. Does this mean you have already fastened off CA? Looking at the finished photo it looks like maybe you come back later and overlay CA over CB with Tr? I’m not that experienced so maybe these are stupid questions. I have been working on this pattern for awhile now and have several squares completed. It occurs to me that there are no pictures of the finished product. What color(s) are used and how do you put them all together? I LOVE this pattern. My 6 year old Granddaughter is into peace sign everything (too young for peace signs?? LOL)! On Rnd 4 where it says (takes place of next 2 sts of current round), does that mean to skip two stitches and place the sc’s in 3rd and forth ch from the last sc before tr? I’m lost. I am not getting 24 stitches no matter what I try. I am only getting 20 stitches when I am done. I thought I followed instructions to a T but am not getting proper end result. What am I missing, or misunderstanding? Thanks!! Hi Debb 🙂 Yes, the 2 tr in the FL of the st from Rd 1 below are worked instead of the next 2 stitches of the current round. So when you start the next 6 single crochets, you will be starting them after the 2 skipped stitches. Make sense? LOVE LOVE LOVE this and see many magical adventures in my future with this pattern. However – I end row 4 with 24 stitches, but row five and I cannot come to agreement on 32 sc- I’ve always got more than that. Has anyone else had this problem? Hi Jenn 🙂 So glad you like it! For Round 5, make sure you are working repeats of 2 single crochets, and then 1 single crochet in the next, and 1 single crochet in the next. That should bring you to 32. YAY! It worked – thank you for your help! LOVE this granny square!! Could you pleeeeeeease do a video tutorial? I’m new to crocheting, but not to knitting. A video would help SO much!! 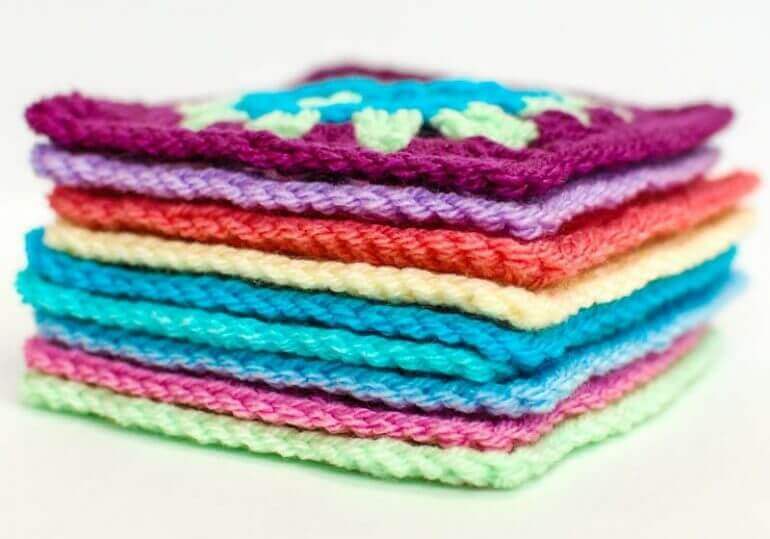 Hi Kara, I hope you can share maybe on youtube on how you made these lovely squares. Thank you! This is the first time I am doing something like this in a round and I am unsure if I should cut colors each time for just join in color b and then pick color a back up. It isn’t like working rows where you pull it back up the side and I don’t want a million loose ends. What did everyone do? Cut or not to cut? This is totally unique! 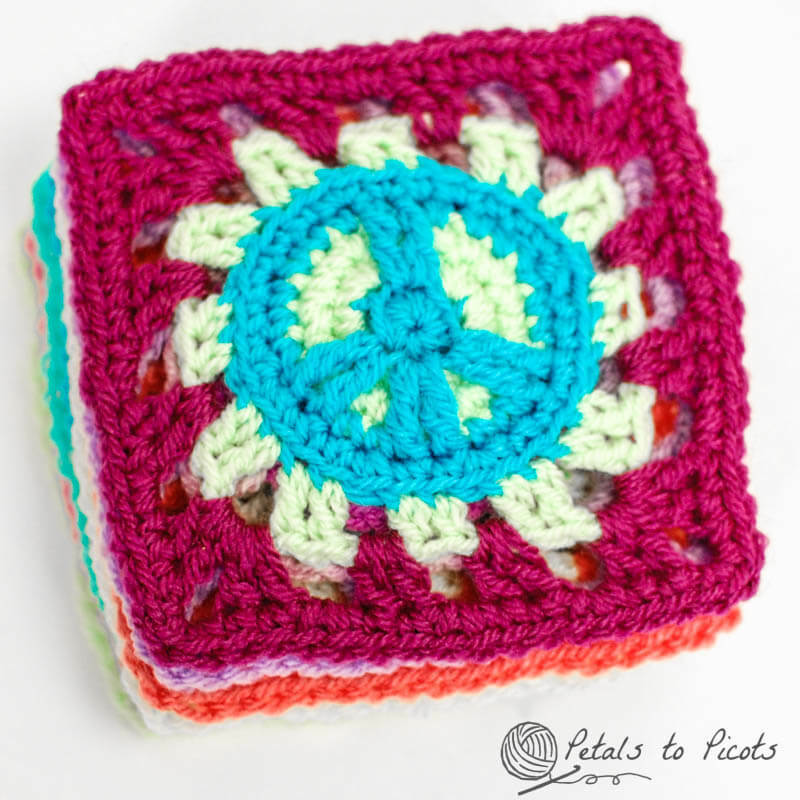 I haven’t seen a pattern for a peace sign granny square before. Great job, Kara and thanks for sharing at Hookin On Hump Day! What method did you use to join the finished squares? Hi Kate 🙂 I honestly did not join them yet but probably will just slip stitch them together. Love these, thanks for sharing. Does it correct itself after the last rounds? It should. Hmmm … I just worked one up and it came out square for me. I do always block my squares to get them nice and sharp. Perhaps that would help? Make sure you are working 2 sc in first stitch and then 1 sc in each of the next 2 sts. That should work out to 32 sts. See my responses to Angela above. Hi, I love your peace sign granny square! What a great idea! I just love this pattern but i am having a very hard time making it. On round 5 I come up with 36 stitches not 32. I have tried 3 times and each time my stitch count is correct till i get to round 5. Is anyone else having this problem? Hi Angela, Sorry you are having trouble … I will try to help. I just went back and recounted my stitches and still think I have it correct. Are you getting the correct count after Round 4? If so, for Round 5 are you working 2 sc and then 1 sc in the next two sts? If you are accidentally working 2 sc and then only 1 sc in the next you would get an end of round count of 36 sts. Let me know if this helps at all. Another way to word it would be work 2 sc in next, 1 sc in next, 1 sc in next, and repeat around. Thanks Kara! That worked out just fine! Cool design. My daughter would like a quilt withe these. 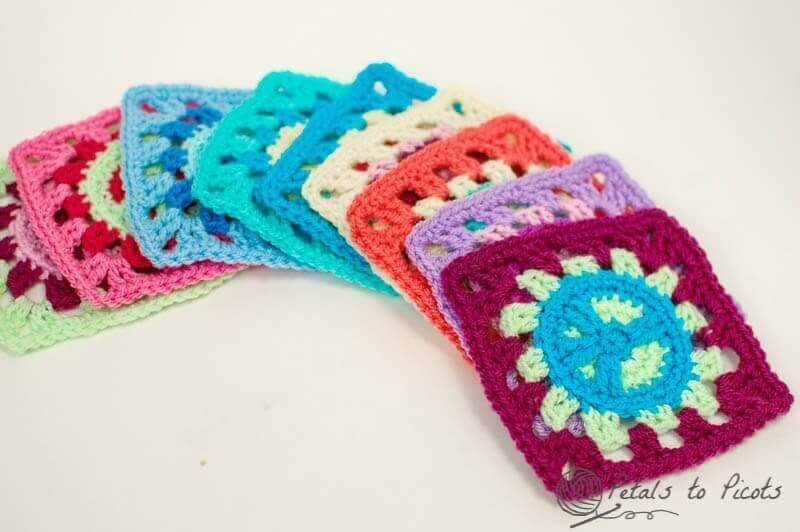 These are the coolest granny squares I’ve ever seen!! What a fantastic idea. Good job! Thanks for the pattern, my soon to be 11-year old will love this! Really love the pattern! Wish I could have printed it in 3 pages instead of 20. Can’t wait to crochet it!!!!!!! I know … I wish I could figure out a way to format the printing to just the pattern. I’ve been playing with different plugins but none seem to do the trick. My printer when you hit the print button a box comes up asking what color you want, what pages you want, etc. So you can select pages say 3-8,11 or whatever pages you want so that it is only the pattern. LUV this pattern. How long does it approximately take to make one square. This is so great! I have to do this. I was in high school in the 60’s in San Francisco and I feel like it was the symbol of our generation. Peace. Beautiful design , thank You ! Would You mind Drawing The scheme ? I will try to work one up. Great! How did your daughter like the afghan? if you get one up, please let me know where to find that video!!! These are very cool!! Your daughter will be sure to love it (be prepared for the requests for more from her friends!). Oh no! One afghan is enough for me! LOVE it! How neat is that? I don’t know why my blog post linked, that’s neat. I’ll have to see if I can put that feature on my blog too. Do you know what the feature is called or does it link automatically? It’s called Comment Luv. It is a plugin you can add that links to peoples latest posts when they comment. A pretty and interesting square! Love it:) Thanks so much for sharing the pattern Kara. The squares are amazing! Great idea, thanks for sharing! It looks nice!! Thanks for sharing !! I am having trouble with the first row of tr… I am always ending up with more sts it does not look like yours. It says to repeat twice but it still is not the same. Hi Deiree 🙂 are you skipping the stitches in the current round when you do the Tr in the sts of Round 1? Hi Mary 🙂 First, locate your 1st treble from Round 4. Join your yarn in the back loop of the single crochet that was worked into that treble.